Summary: in 1946, a hooded serial killer terrorizes the town of Texarkana, Texas. Loosely based on a true story. Talk about a complete snooze-fest. Armed with an evocative name such as The Town That Dreaded Sundown, I was expecting a little more than a by-the-book serial killer movie. Unfortunately, that’s exactly what we get with this one. This review is going to be short, simply because there’s not that much to talk about; it’s that dull. The story is less a slash flick and more a police procedural, but with little in terms of any sort of drama. Events unfold with very little emotion behind them and with an emotionless voiceover to lead the way, the film is void of any real heart. What drew me to this title was the fact that a remake recently premiered at the Fantastic Fest. The remake has a pretty good cast (Gary Cole, Denis O’Hare), so when this came to Netflix, I decided to check it out. Hopefully, I’ll get a chance to see if the remake improved on the original’s deficiencies, but to be honest, this one is not exactly worth your time. The gore here is fine. You get some bloody deaths, but nothing too outlandish. 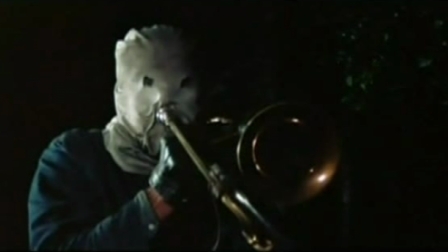 There’s one murder scene involving the slide of a trombone, but despite tat description, it’s surprisingly generic. This is not a scary movie, whatsoever. The voiceover makes the whole affair feel like an episode of Unsolved Mysteries, we get minimal connection to any character, and it is just plain boring. There’s nothing to see here. Despite the fact that murders occur on Lovers’ Lane sort of locales, similar to a Zodiac or Son of Sam situation, the film treats the 1940s time period like the puritanical era Hollywood would still like us believe it was. This movie isn’t necessarily bad; it’s just not very interesting. It more or less simply exists as a movie. That’s about as kind as I can be to it. There are better movies from the era out there.